Creekside Retreat - Cottage with Walk In Shower for 2, private Hot Tub & access to the CREEK! This Newly Remodeled country cottage is only 8 miles from Helen, Ga. Walking Trails, Gardens, Private Stocked Trout Pond, and the BLUE CREEK. This adorable country cottage is perfect to relax in the private Hot Tub or use the Charcoal BBQ Grill to cook up your fresh caught trout from the creek or our stocked pond! A full size Pool Table & a Fire Pit gives you activity options while you are at the cabin. If you should venture out it is only 8 miles from downtown Helen, Ga! The babbling creek is within walking distance to this cabin as well as our Native Herb & Vegetable Gardens! David and Mariana, the owners of this cabin will share some of their garden treasures with you whenever possible, just ask. Take advantage of our nature trails either along the creek or in the woods. 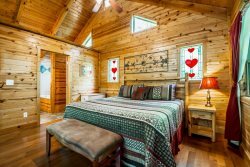 Book this cabin & you are sure to RELAX and ENJOY your getaway. Min AGE of primary renter: 25 Years Old. Pet Policy: 1 dog only. Under 15 lbs. $50.00 pet fee; You MUST keep your pet in the leash at ALL times. We offer delivery of firewood. 3 bundles of firewood. $24 upon availability. Dist from Helen: 15 min. Dist from Office: 2 min. Dist from Trout Pond: 1 min. Private Stocked Fishing Pond Package: $39.95. Catch up to 10 Trout. No catch & release. Yes, 100%! All transactions take place through SSL secure channels. We don’t store credit card data and will never share or sell personal or financial information with or to any third-party organizations. Upon completing the payment, we will email you a Receipt and the Reservation Confirmation that will have a link to the Blue Creek Cabins Rental Terms to be completed online & signed electronically. Complete the Rental Agreement and also please send a clear photo of your ID and send it via email at [email protected] or text it to our office number: (706) 865-1405. Fourteen days before your scheduled arrival date your final payment is due. Before charging your credit/debit card on file, you will receive an email reminder. If your reservation is made less than 14 days of your arrival date, the entire amount due will be charge to you credit/debit card. After the final payment is made and all documents received, we will send you another email that will contain detailed driving directions, lock box /key code and other important Check-in information. This community is ideal for large group bookings and is within walking distance from the stocked trout pond and rushing Blue Creek. Our two vegetable gardens are also within walking distance so remember to request a tour and sample some of our fresh findings. You can also enjoy short walks on our maintained trails where you can try to identify some of our local wild edibles plants. Our Event Hall can accommodate up to 50 people and can be used for your event by request.